This 19th Century "crankie-sized" moving panorama is owned by British artist David Brill. It was painted around 1860 by David's great-great grandfather, John Lamb primus, and his son, John Lamb secundus. I had the great pleasure of meeting David at the International Panorama Council conference in Switzerland in 2013. He presented a digital copy of the panorama while reading the narration. The scroll had been stored at the Museum of London. It has a new home now! See note at the bottom of this page. 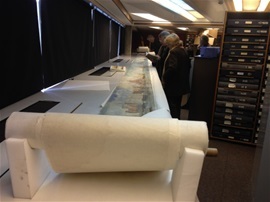 The scroll is .375 meters X 53 meters, approximately 14" high and 173 feet long! Watercolor on paper then mounted on fabric. This "parlor" panorama, as the smaller ones were sometimes called, was performed at home during the Christmas season. A special family treat. The painting tells the story of a trip from London to Hong Kong, taking the overland route. Viewers "travel" by boat, train and horseback. Plus they experience a mirage in the desert and a storm at sea! David has created a website that tells about the panorama and his family. Photos of the scenes were digitally stitched together so that you can watch it! Click here to reach the home page, then scroll down to the bottom of the page to view the video. This is a view from behind the scroll. Some of the fabric backing was cut away and a mirage image was painted on the back. To create the mirage effect, the artists removed some of the fabric on the back of the scroll, leaving a thin layer of paper. 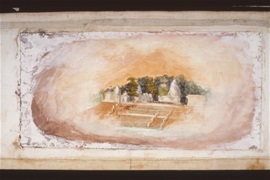 An image of the city was painted on the back of the scroll. This is a view from the front with the scroll being backlit. The mirage appears. When the mirage scene is backlit, the city appears. COOL! Moonlight was one of the most popular special effects in 19th Century moving panoramas, big and small. 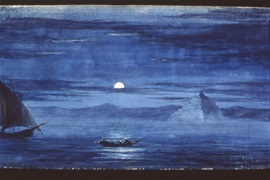 The same technique is applied with the moonlight scene. The fabric behind the moon was removed. When backlit, the light illuminates the moon. 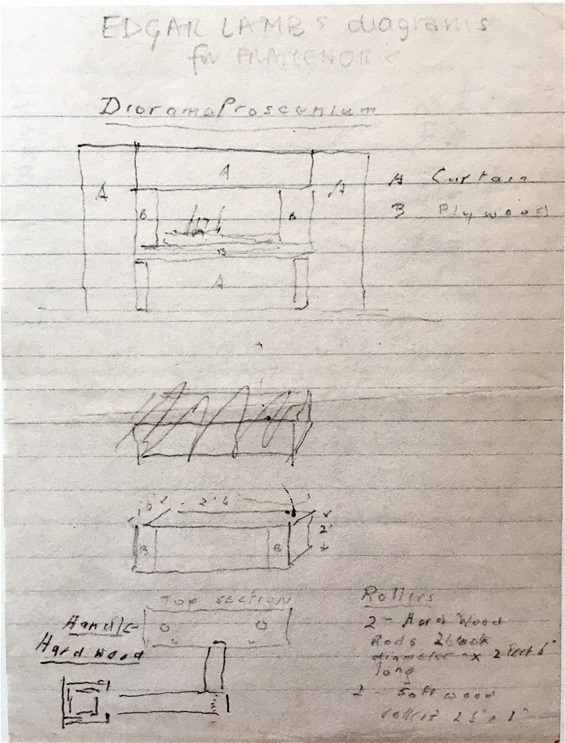 The viewing box, or panorama proscenium, did not survive, but a sketch of the box does. It features curtains and was about 24" square. Many thanks to David for giving me permission to use the photos. Check out his website of paintings and origami at brilliantorigami.com. Update - The moving panorama was auctioned at Sotheby's! December 2018. 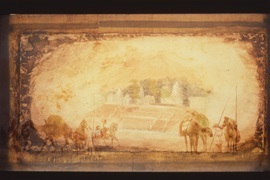 The moving panorama was auctioned at Sotheby's. I don't know who purchased it. A private collector or a museum? It wasn't me! All will become known eventually and I will let you know!